Kusamba is a coastal village located in the District of Dawan, Klungkung Regency, Bali. 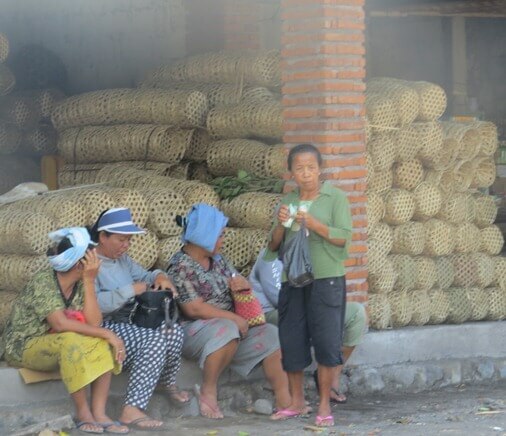 The majority of local residents work as fishermen and traditional salt makers. 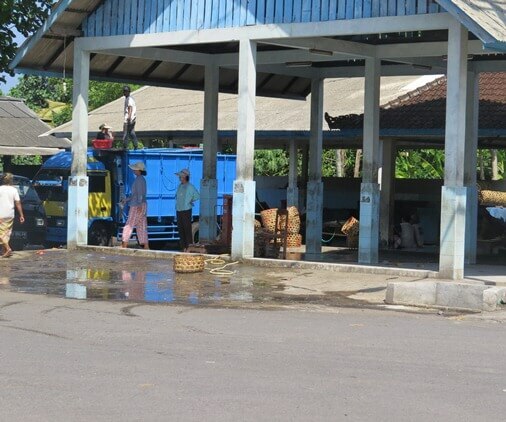 In the village there is also fish market and boiled fish processing center. 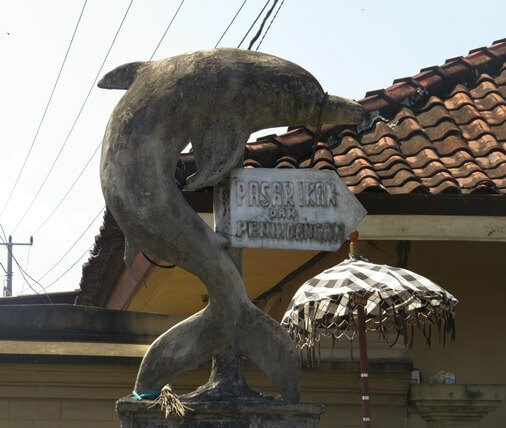 There is also a port that serves the transportation of goods and people to Nusa Penida. Until the 18th century, Kusamba become an important port of Klungkung Kingdom, located in the east of Semarapura. In the village, which is told full of thatch grass (Kusa means thatch grass), the King of Klungkung I Dewa Agung Putra build a palace called the Kusanegara, and became the second administrative center of the kingdom of Klungkung. This has contributed to the development of the port of Kusamba, equivalent to the port of Kuta at the time. The existence of the Kusamba Village cannot be separated from the Dutch intervention in Bali in 1849. The Dutch attacked in the northern and southern parts of Bali. 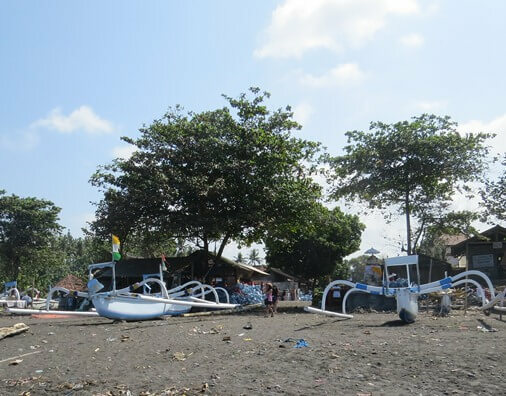 The pretext used to attack by the Dutch is the law of "tawan karang" or claims over shipwrecks, which are customary to Balinese, but unacceptable under international law. Before attacking the kingdom of Klungkung, the Dutch has managed to subdue the kingdom of Buleleng (Jagaraga) and the Kingdom of Karangasem (Padang Bay), which ended with the ritual suicide or "Puputan". From Padang Bay, the Dutch had occupied Goa Lawah and repelling the Klungkung forces of up to Kusamba. The Dutch also managed to occupy Kusamba and set up camp at the Royal Castle. But in the early morning, the sister of the ruler of Klungkung, Dewa Agung Istri Kanya, led a night offensive against the Dutch in Puri Kusamba and take the life of the commander, Major General Michiels. The Dutch were forced to retreat in haste to their ship in Padang Bay, confronted by a force of Balinese from Badung, Gianyar, Tabanan and Klungkung. 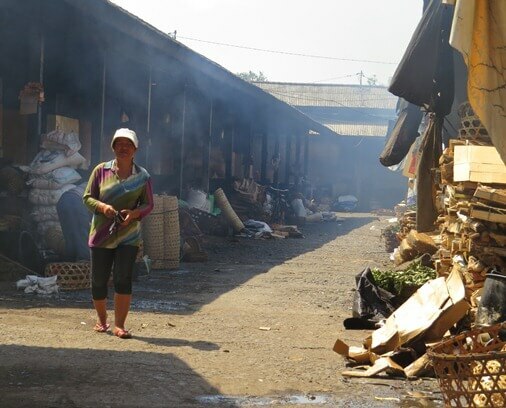 In addition to the fish trading, Kusamba fish market also becomes the processing center of boiled fish. "Pemindangan" or boiled fish is a way to preserve fish. Boiled fish is produced by the combination of boiling water and salting. This process created fish processed products with low salinity. Fish treated by this process is pelagic fish species include tuna, flying fish, trevally, lemuru and others. The process begins with cleaning the fish, smeared with salt, and arranged layered in containers or baskets that use a mat of banana leaves. Furthermore, the basket is placed in a large boiling container. The boiling process may take 1-3 hours and salt seep in fish. Boiling process will kill most of pathogenic microorganisms in fish. While salt plays a role in the process of preserving fish, improve the taste and texture of meat become more compact. Byproducts of this treatment process are the result of boiling water (broth), known as Petis. Beach, fisherman and salt production activities in the village of Kusamba have been embedded in the life of local communities. 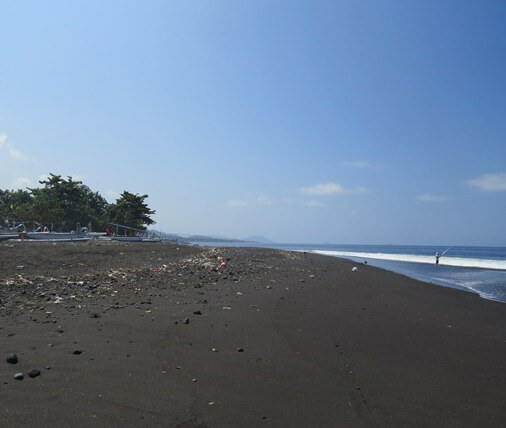 Kusamba beaches have grays-black sand, beautiful and full of tranquility. This beach has a beautiful view of the mountains of Bali, the blue sea as source of livelihood of fishermen, and direct view of Nusa Penida. In addition, visitors can also see the beauty of the double outrigger fishing boat moored on the beach. 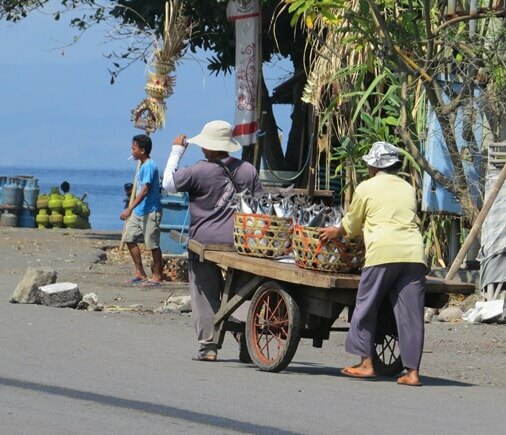 The traditional fishermen usually moor their boats on the beach and sell the catch at the Kusamba Fish Market. Traditional salt-making activities are also become source of livelihood and gradually developed into one of the objects of interest to the tourists because the unique and deserves appreciation. Local residents producing salt in the traditional manner, by a tradition passed down from generation to generation. The salt makers will undertake the manufacture of salt when the weather is scorching, starting with making or flattening the sand. Then they took the sea water by using water containers made of palm leaves and sprinkling it to the sand that has been flattened before. This process is done repeatedly, then left to dry with the help of sunlight, to form kirstal salt. It is collected after the sand dry and salt crystals formed, then being transported to the filtration place and put in a special container for the filtration process. The sand is watered again by using sea water and the filtered water is collected in a big container. Then, the collected water is dried under the sun on the container or gutters, made of coconut or palm trees, elongated, with the middle part shaped like a trough (basin). Salt water left to dry naturally, harden and form salt crystals. The salt is then dredged up into granules of white salt, drained and ready for sale.